HAWTHORN made a mess of Melbourne in round four, kicking 16 of the last 17 goals to salute by 67 points on a miserably wet Sunday afternoon at the MCG. The match marked David Mirra's first AFL game, Demon Christian Salem's 50th, versatile defender Ben Stratton's 150th and former Hawk superstar Cyril Rioli's last (at least for now). It was Melbourne's biggest loss of the year – ahead of the 46-point defeat to Richmond the next week – and Hawthorn's second-largest winning margin, behind the 72-point demolition of Carlton. The Hawks laid a season-high 113 tackles to the Demons' 74 and won the clearances, 56-38, despite Ben McEvoy losing the hit-out battle, 72-34, to All Australian ruckman Max Gawn. Melbourne ranks fourth in the competition for clearance differential compared to Hawthorn's ninth, and has lost that statistic only seven times in 23 matches. More remarkable was the Hawks lost James Frawley (migraine) for the second term and were without Rioli (knee) and Paul Puopolo (hamstring) after half-time and three-quarter time, respectively. Their 18.7 (115) scoreline, which dwarfed the Demons' wasteful 6.12 (48) – Tom Bugg kicked four behinds without a goal – was their third-highest tally in 2018 and defied the conditions. This was an outlier result in so many ways. Eyebrows were raised from the time Melbourne started without wingmen at the centre bounces, on top of using 185cm James Harmes to support 208cm giant Gawn in the ruck. But there was at least one common denominator: a Hawthorn victory, the 15th in the past 16 meetings between the clubs. Their next clash is on Friday night, back at the MCG, but this time in a knockout semi-final that offers the winner a preliminary final berth. So will the teams' most recent showdown count for much, or anything, in the first final between them in 28 years? The Demons look set to field seven different players – almost one-third of their line-up – on Friday night from that April afternoon, while the Hawks are likely to have four changes. Melbourne boasts the competition's most potent offence, yet its forward line will be unrecognisable from that Hawthorn hiding. Jesse Hogan, Dean Kent, Jeff Garlett and Tom Bugg played in attack that day, whereas Tom McDonald, Sam Weideman, Mitch Hannan, Charlie Spargo and Aaron vandenBerg are in there now. Weideman is fresh from a breakout finals debut against Geelong, where he amassed three goals from 24 disposals in arguably a best-on-ground performance. Only five players have kicked more than McDonald's 49 majors in 2018, while Jake Melksham failed to kick a goal in the first four rounds but ended the season stiff not to be an All Australian nominee. The Demons won't have star defender Jake Lever (knee), and the Hawks will sorely miss their own gun backman, Stratton (hamstring). But Hawthorn will have the services this time of Shaun Burgoyne, Ryan Burton, James Worpel and Jon Ceglar, who will back up McEvoy in an upgrade from Tim O'Brien and Jarryd Roughead. The midfield, as it was in the last game, will be pivotal – and a new cast of players will duke it out in the centre square. Nathan Jones, Salem and Christian Petracca attended 50 centre bounces among them against the Hawks, but combined for just 31 in Melbourne's past three victories. Instead, Harmes, Angus Brayshaw and Jack Viney, who returned from a toe injury last week, mostly partner Gawn and Clayton Oliver in the centre cauldron. Salem and Bayley Fritsch have gone into defence, where their kicking skills are taken advantage of, while retirement-bound Bernie Vince fell out of favour even before hurting his AC joint. There has also been a slight brown and gold reshuffle. McEvoy, Tom Mitchell, Liam Shiels, Jaeger O'Meara and Dan Howe remain regulars, but joining them as mainstays now are Burgoyne and Worpel, who generally starts at the first centre bounce. Speedster Jarman Impey, who has switched from attack to defence, attended 11 centre bounces against the Demons, but just four in total across the past nine matches. Stratton's sudden absence will be felt, because he is one of those rare defenders that can play on any forward, but it's in attack where, like Melbourne, Hawthorn will look most different. 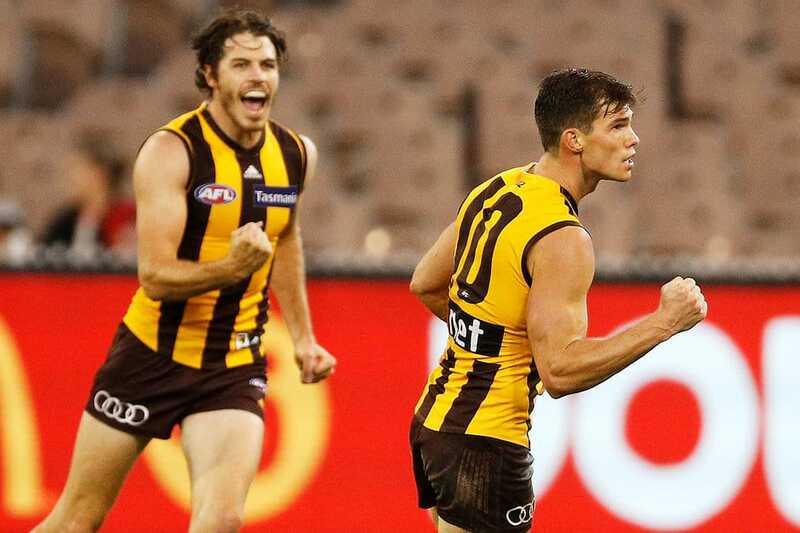 Hawks coach Alastair Clarkson loves operating with three small pressure forwards, which – until round four this year – was typically Luke Breust, Puopolo and Rioli, who are just as gifted offensively. Will Langford attempted to fill Rioli's shoes defensively early on, but in the past four matches it's been Irishman Conor Nash, who looks in danger of being axed. The Hawks may turn to utility Taylor Duryea to perform that role against the Demons after he played as a defensive forward in the second half of last year. O'Brien is a whipping boy at Hawthorn, but arguably the two best of his 46 matches were against Melbourne, including three goals in round four, and 10 marks and two majors last year. He is playing as a backman in the VFL now, so it will be one of Ceglar or Ryan Schoenmakers – if he is recalled – as that marking target this time alongside Roughead and 2018 All Australian Jack Gunston. All of this illustrates just some of what has changed in the five months since Clarkson's Hawks mauled Simon Goodwin's Demons. Hawthorn may well win again on Friday night, but neither coaching staff is likely to look too deeply into that round four outcome for inspiration.